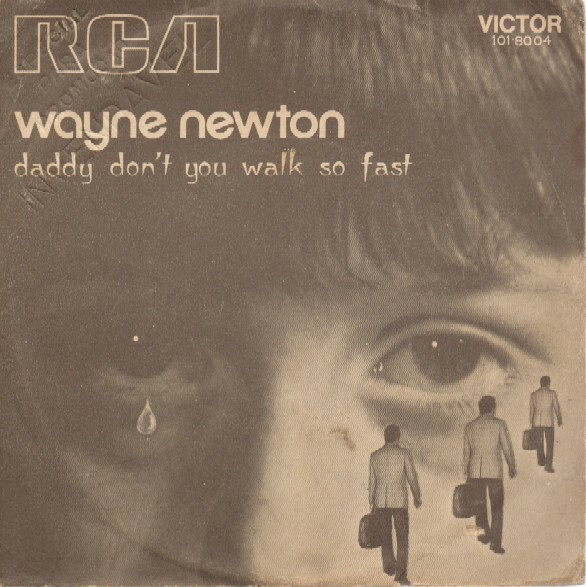 Hans Worst Hits of the 70’s- “Daddy Don’t You Walk So Fast:- Wayne Newton. We can’t blame Wayne Newton for writing this wretched song-that distinction goes to Peter Callander and Geoff Stephens. Callander also had a hand in writing the equally awful “The Night Chicago Died” and ‘Billy, Don’t Be A Hero.” Daddy Don’t You Walk So Fast sold over a million copies and peaked at #4 on the Billboard chart so I guess Callander laughed all the way to the bank. Mr. Las Vegas only had four hit singles- if asked I could of course name two- Danke Schoen #13 in 1963 and this one in 1969. His others were Red Roses For A Blue Lady #23 in 1965 and one I certainly don’t recall that was in my time- 1980s Years #35. At times I’ve thought when hearing Newton sing that it was a woman singing. Newton has done over 30,000 shows on the Las Vegas strip. I never got his appeal at all- a major no talent. OK back to this song- I’ve always had a dislike for it- partly due to Newton’s singing, partly due just to the song itself- a 50/50 split. I don’t think Sinatra could have saved this turkey. But the song is one of those songs that some relate to- I remember a girl in high school who told me her favorite song was Daddy Don’t You Walk So Fast- I didn’t press her as to why it was her favorite song but I thought I knew -her parents were divorced and she lived with her mother. Wayne Newton thankfully hasn’t released a new album since 1978. Not that he’s gone away but at least he has quit recording new music. Another thing he should have quit was the plastic surgeries. I mentioned the late Burt Reynolds and Kenny Rogers as bad examples of fellas who just over did it- I forgot Newton- who is now painful to look at. There is nothing wrong with growing old and looking it. Look at Clint Eastwood. I hope Wayne doesn’t track me down and slap me in the face- as he says he did to Johnny Carson for making jokes about him on The Tonight Show. I’ve always thought of Wayne Newton as famous for being famous…and him being synonymous with Vegas. I don’t know how a lot of these guys sell out Vegas night after night. I wouldn’t walk across the street to see him…unless I was paid a good deal of money!! 30,000 shows???? how on earth could he stand to do that night after night. Not sure if you saw the movie, Blade Runner 2049, but there is a scene at Vegas — yes Vegas is still there in 2049 — where they have holograms doing the shows. I can foresee a Wayne Newton hologram show in the future…. Great choice of worst today! Thanks.. Yes I could see that happening- Wayne will be long gone but how can they just let him go? They have to sign a contract with him before he departs to keep the act going. I can’t wait for the Captain Beefheart one too!! Pretty soon everyone will be on a hologram tour. Onward we go into our Brave New Virtual World. who would have ever thought- the stuff that’s going on now- not that long ago. I think he did- he had his first hit in his early 20’s- then I think he got connected with people in Vegas. It’s weird reading a little about him- he was born in Virginia, the family moved to Ohio when he was young and then to Arizona due to his asthma. For some reason I expected to read he was born on another planet or something or in Vegas! His dad was an auto mechanic. I half expected to read his father was Bugsy Siegal.